Are you looking for a great idea for a decorative 4th of July watermelon fruit salad to bring to a party? Here is an idea for you. A red, white and blue star spangled, 4th of July watermelon fruit salad bowl. This carving of mine was featured on the websites of People magazine, House Beautiful, and Country Living. You’ll need a watermelon, blueberries and a large jicama. 1. 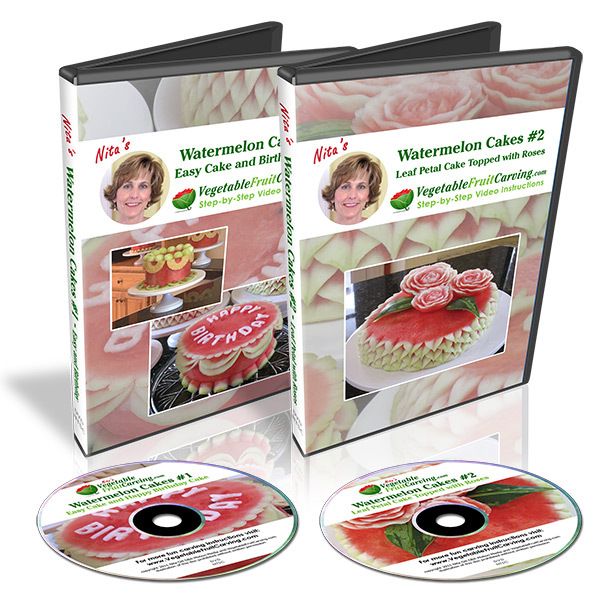 Lie a large watermelon on it’s side and slice off the top 1/4. Cut out the fruit inside so that you end up with a watermelon “bowl”. you can take the watermelon out with a melon baller or cut out chunks large enough to slice and then cut stars using a small star shaped cookie cutter. 2. Slice your jicama into 1/4 to 1/2 inch slices. Using a small star shaped cookie cutter or fondant cutter, cut star shapes. 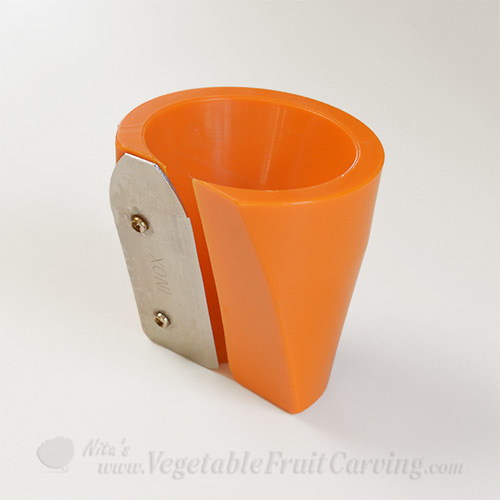 You can get these cutter very inexpensively at Michael’s craft store or most other cake decorating shops. If you don’t have jicama, you could substitute apples for the stars. Just make sure to put them in a bowl of salted ice water for 10 minutes or brush with lemon immediately after you cut them. This will help slow down the browning that occurs when apples are exposed to the air. Jicama is a better choice because it is whiter than apple and won’t brown. 3. 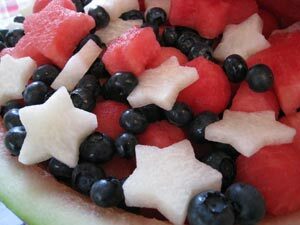 Place the cut watermelon, blueberries and star shaped jicama back into watermelon and VOILA you have a star spangled red, white and blue, 4th of July watermelon fruit salad. 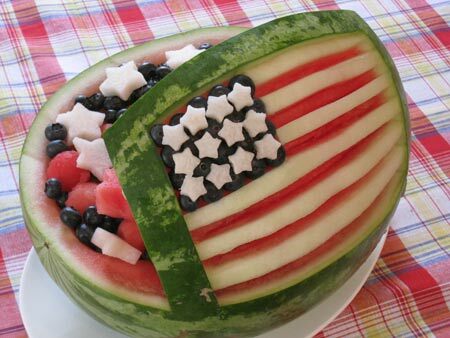 OPTIONAL: If you like, you can carve a flag design into the outside of your 4th of July watermelon bowl. Shave off the green rind where you want to carve your flag, Then when you cut away stripes of the flag from the white rind, you will reveal the red fruit for the red stripes. If you are going to do this, do the carving prior to adding the fruit into the watermelon bowl. OPTION 2: Or, you can use the inside of the rind that you cut off the top and carve a flag into the inside where you can cut away the red fruit to reveal the while rind for the stripes. You could toothpick blueberries into the blue area of the “flag”. Sorry I don’t have a video to show you this time. All my time has been immersed in developing my upcoming membership site where members will be able to access more video lessons. Update 7/5/2010 – I brought this to a party yesterday and it was a big hit! Everyone loved it. Update 7/5/2010 – My mom took the cookie cutter star idea and lined a glass serving bowl with the stars arranged in a pattern that would show through the glass. Then she filled with the fruit salad. She got lots of ooohhs and aaaah from the guests at the 4th of July party that she attended. P.S. Usted encontrará las instrucciones en español en la sección de comentarios de esta entrada del blog que uno de mis lectores traducida. P.P.S. I’d love to see photos of your 4th of July watermelon salad bowl. Update July 3, 2011 – To see another 4th of July red and white striped watermelon bowl idea, click here. P.P.P.S. To see more lessons showing how to make red, white and blue edible bouquets perfect for the 4th of July, click here. excume, do you have magazine in espanish or book,I like,please took my. I’m sorry but I do not have instructions available in Spanish right now. please enjoy the salad and do visit vegetablefruitcarving again…. He aquí una idea para ti. Una ensalada de color rojo, estrella blanca y azul de frutas lentejuelas. Usted, Äôll necesidad de una sandía, arándanos y una jícama grande. 1. Lie una sandía grande en él, el AM lado y corte los 1 / 4. Cortar la fruta en el interior de manera que usted termina con una sandía, Äúbowl, la United States. usted puede tomar la sandía con un melón o recortar trozos lo suficientemente grande como para rebanar y cortar las estrellas con una pequeña estrella cortador de galletas en forma. 2. Slice su jícama en 1 / 4 a 1 / 2 pulgada. Utilizando una pequeña estrella cortador de galletas en forma de pasta de azúcar o de cuchillas, corta formas de estrellas. Usted puede obtener estos cortador de muy bajo costo a Michael, tienda de artesanía o la mayoría de los oficiales administrativos pastel de otras tiendas de decoración. Si no, AOT han jícama, puede poner las manzanas de las estrellas. Sólo asegúrese de colocarlos en un recipiente de agua helada con sal durante 10 minutos o un cepillo con limón inmediatamente después de cortarlas. Esto ayudará a frenar el pardeamiento que se produce cuando las manzanas están expuestos al aire. Jícama es una opción mejor porque es más blanco que la manzana y ganado, AOT marrón. 3. Coloque el corte de la sandía, jícama arándanos y en forma de estrella de nuevo en la sandía y VOILÀ tiene una estrella estrellada rojo, blanco y azul ensalada de frutas. OPCIONAL: Si lo desea, puede hacerse un diseño de la bandera en la parte exterior de la taza de sandía. Rasurar la corteza verde en la que desea tallar tu bandera, entonces cuando ust lejos franjas de la bandera de la corteza blanca, que permitirá conocer el fruto rojo de las rayas rojas. Si usted va a hacer esto, hacer la escultura antes de añadir la fruta en el tazón de la sandía. OPCIÓN 2: O bien, puede utilizar la parte interior de la corteza que se corta la parte superior y tallar una bandera en el interior donde se puede cortar la fruta roja para revelar al mismo tiempo la corteza de las rayas. Usted podría palillo de dientes arándanos en la zona azul de la, Äúflag, la United States. Thank you Zubbin for translating! P.S. I don’t speak Spanish, only a few words, so for those of you who do, I hope these instructions that Zubbin so generously wrote for us are clear to you. Thank you for salad idea.Unfortunately I haven’t anything about 4th of July. July 4th salad is a beautiful piece of art. Fantastic Idea , very nice, unique really! all the best! Hi,Nita.I love it!Thank you very much! OMG!! I wish I would have seen this sooner! I would have made it for the party I went to. What a fantastic table topper! Yep, sorry I was so late getting this idea out. Thank you for sending me diffrent ideas. to do the same jon. I received my video today, I’m glad, I watched it twice. I would like to know how many fruits and vegetables carving videos do you sell? Since this message about a year ago, I have a number of lessons available including an 11 week course. 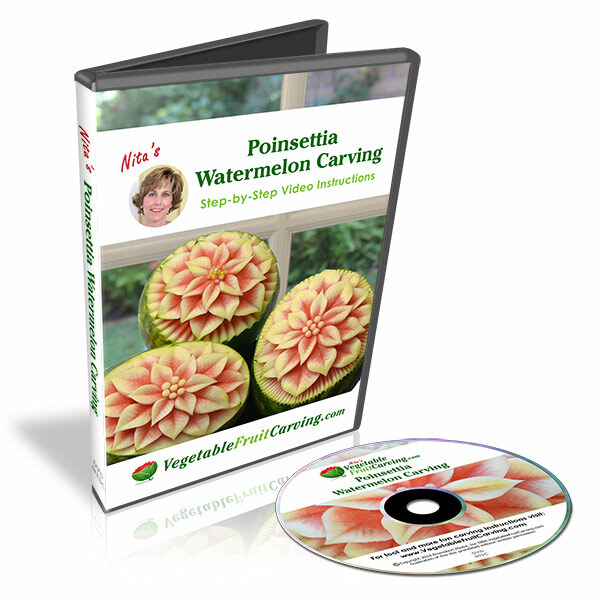 You can find information on all my currently available lessons in my shop at //www.vegetablefruitcarving.com/vfcmembers/shop or you can just click on the “SHOP” link at the top of this page. I made 2 salads, one for the potluck at church and one for the fireworks party. I didn’t use the watermelon shell—used crystal bowls instead, lined the sides with vertically placed jicama stars and a circle of the same on top in the middle. Lots of oohs and aahs. Everyone loved it! I should have taken a picture but forgot. Thanks! I’ve seen the salad, which you’ve send me. it si fentastic. I loved it. Very soon I am going to try that. thank you. 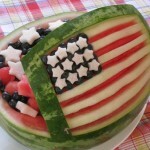 That is a great idea of the Independance Day watermelon. I am not an American and I usually give a rare comment about the 4th of July crafts. But the flag in watermelon is made perfectly. I am ready to start carving! Thank you for this helpful info! I cant wait to impress my family with these new skills!